Nextiva vFAX is an easy-to-use and affordable online fax service that offers great flexibility. In order to use Nextiva vFAX, all you need is an Internet connection. You can fax by email, via Microsoft Office, the Nextiva online control panel, cell phone or even with your own fax machine (fax machine’s are supported via Nextiva’s fax bridge adapter). Now you don’t have to worry about paper jams, system errors or busy signals. You’ll never miss another fax! Amazing Product Support - Our focus at Nextiva is on building lifelong client relationships, no matter how big or small your company is. Our product support is unparalleled. Award Winning Provider - We have received more IP communication awards than anyone else in our industry. Nationwide Presence - We serve over 80 markets nationwide. Nextiva makes it possible for you to have one provider for all of your communication needs. The Right Choice - Nextiva has the expertise, support and services to benefit your business at every stage. Unified Communications - Every customer is unique. We have a portfolio of solutions to fit your specific communication needs. We Know Small Business - Each product we offer has been engineered to give small businesses the resources and advantages of a large company. Redundant Network - When you choose Nextiva, you get the reliability of our network. We pride ourselves on offering exceptional dependability and scalability. Green Certified - We are part of a national movement of environmentally conscious businesses working to reduce our carbon footprint. If you use or have used Nextiva vFax in the past, please share this page using the buttons above and be sure to leave a rating and review of the service so other people can make an informed buying choice based on your experiences! It's free and you are not required to register! If you have experience with Nextiva vFax, we kindly ask that you please share your thoughts with others on this website by submitting an honest, detailed review. Your feedback will help prospective clients decide which service provider to choose and is incredibly valuable to the community itself as well as Nextiva vFax's representatives that read this website. Please do not use this form for support inquiries. Be aware that these reviews may also be syndicated and displayed on Nextiva vFax's website, and as such a strict review policy is in effect. All reviews are moderated prior to being published, and reviews that do not contain concise, detailed comments or do not support their associated ratings will not be published. We urge you to be as detailed as possible when leaving feedback, as Nextiva vFax may also use this information as feedback for their business and are themselves encouraged to reply to reviews posted to their listings. Nextiva vFax 2013-10-14 01:11:53 J.B.
Coming from paying AT&T $35 for each of our fax lines (6 of them), Nextiva has saved me lots of money. It's different from a typical fax line but by different I mean it's much better. Faxes come in and go out faster. We don't hear of complaints that people can't send us faxes and best of all, the faxes get sent to our email addresses. 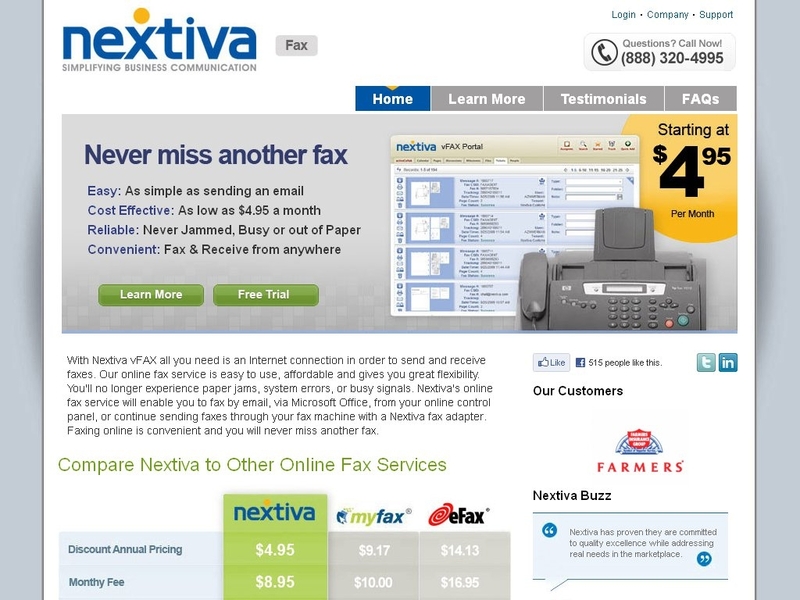 Nextiva has practically turned the fax service into an email service. I haven't had a physical fax machine connected for years now. However, I recently had a case in which a large government agency could only fax me the information I requested or I could wait 7 days for them the send it by snail mail. I chose Nextiva based on several other reviews and signed up online. I received the activation email almost immediately, but could not login using the username and system-generated password. I called Nextiva customer support and reached an english-speaking human with only a very short wait. He did have to place me on hold for a few minutes but was able to get my activation completed fairly quickly. When I asked why things didn't work, he indicated that they had been seeing issues with online activations due to a system that attempts to prevent fraudulent account creation based on IP address verification. Since I know that my public IP belongs to Comcast and is easily traceable back to the CO, I'm not sure why they would have an issue with my IP. So, now I have a fax number to give Big Brother so that I can turn around and email the information to the person who needs it. Nextiva vFax 2012-08-23 17:07:21 J.M. I am on a 30 day trial basis with Nextiva but seriously considering signing up for one year to lower the monthly cost. So far the service works great, as expected, and as promised. Today I had a fax-bridge question (to use my physical fax machine) so I emailed tech support. Their system immediately sent me a reference number and within a few minutes I received another email, from a live person, with my answer. I liked the support-response time, unlike other companies that promise to get back to you within 48 hours. I'm going to cancel my AT&T analog line and I'm sure I will stay with Nextiva for the long haul. First and only service and I am happy! Nextiva has been the first and only internet fax service I've tried and I'm quite happy with the service. It was a little confusing when I started because I didn't quite understand how to change my information so I could get the faxes to my right email address, but it was admittedly my mistake and the person that helped me on the phone was nice enough to walk me through what I was doing wrong. Overall I'm quite happy and now that I have used it for a while I could never go back to my old machine! Both the phone and fax services are excellent! I have been using both Nextiva's phone and fax service for the better part of the year and I have NEVER had a single problem - I haven't noticed a single outtage in the service since I signed up and I definitely don't regret using them! I'm not a high-volume user, but I definitely get my money out of both services and Nextiva is worth every penny you spend on them. Don't think about it too long, I wholeheartedly recommend them!